Winter canola is an excellent rotational partner with wheat. Integrating canola into a wheat system allows for the cleanup of weedy fields with primarily grassy weed problems. Conventional and Roundup Ready (RR) varieties are excellent choices for managing most grassy weeds including ALS-resistant populations, because grass-only herbicide options can be used in canola without crop injury. For specific grasses that are very difficult to control, like cereal rye and jointed goatgrass, it is advisable to use canola in year one of your rotation and Clearfield wheat in the second year of your rotation before going back to conventional wheat varieties. Due to sensitivity of canola, Clearfield wheat varieties should not be used the year prior to rotating into canola. Canola planting time is just around the corner and many are going out now with preplant burndown applications. Remember that canola is sensitive to dicamba, 2,4-D, and MCPA and these products should not be used inside of 30 days before planting. Glyphosate, glufosinate and paraquat are all potential options for removing broadleaf weeds in no-till systems prior to planting. These products have no planting restriction for canola. Tillage is the best option to remove weeds in conventionally tilled systems. It is important to consider your previous herbicide choices when planning for canola in the fall. Many herbicides used for spring weed control in wheat can limit rotation to winter canola. 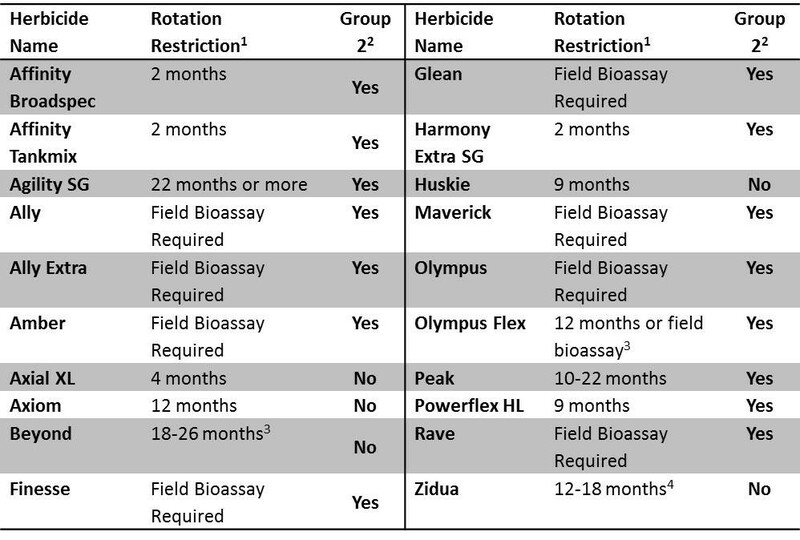 These include all Group 2 herbicides all of which have long rotation restrictions to canola, meaning you cannot plant canola in these fields for 18-24 months depending on the product. See Table 1 for a list of specific restrictions. If you have used one of these products in wheat in the spring, you must plant a canola variety with the SURT trait. Examples of varieties with this trait include: DKW 45-25, DKW 46-15, DKW 47-15, HyClass 115W, HyClass 125W. All of these varieties are also RR. Kansas State also has an open-pollinated non-RR variety called Sumner with the SURT trait for growers that prefer to grow conventional canola. Note that the SURT trait is not a genetically modified trait. No additional in-season herbicide options have been added to the toolbox for winter canola growers in the upcoming season. 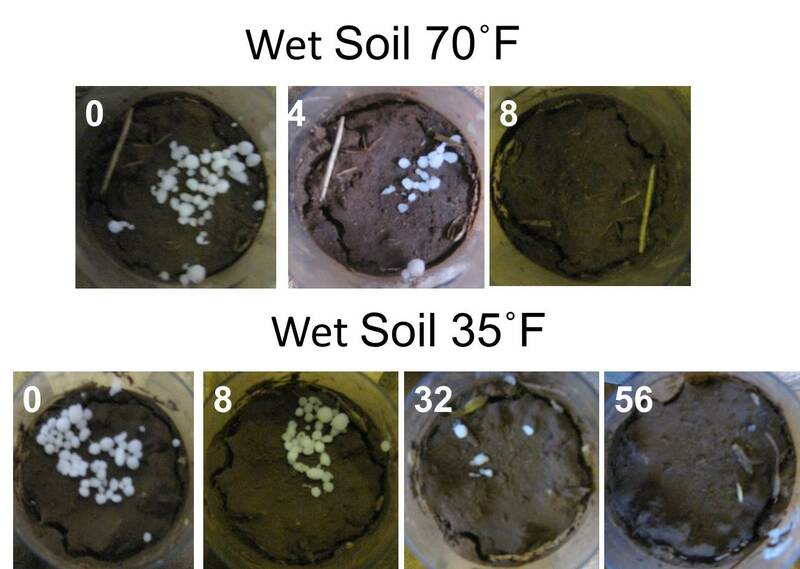 Both trifluralin (Treflan) and ethalfluralin (Sonolan) can still be used as preemergent weed control options in canola in conventionally tilled systems. Both need to be mechanically worked into the ground and need an activating rainfall to work properly. Quizalofop (Assure II), sethoxydim (Poast), and clethodim (Select and many generics) are the grass control herbicides available for use in canola and can be used on any canola variety including RR varieties. Roundup Ready canola growers are allowed two applications of glyphosate at 22 oz/A each over the top of the emerged crop. Clopyralid (Stinger) is the only over-the-top broadleaf control option other than glyphosate. These weed control applications should be made early in the season between 2- and 6-leaf canola, and prior to bud formation, while weeds are still very small. Applications should be spaced at least 14 days apart. Early applications will eliminate fall weed competition with canola and protect yield. For more information or questions involving weed management in canola contact Extension Weed Specialist Angela Post at 405-744-9588 and follow @OSUWeedScience. applied in crops other than wheat please refer to the herbicide label. 1Minimum interval between herbicide application and seeding canola. Refer to full herbicide labels for specific information as geography, pH, and rainfall may affect this interval. 2Rotation restriction can be overcome with use of a SURT canola variety. 3Rotation intervals depend on geography. 4Rotation interval depends on herbicide rate. When it comes to pre-plant fertility issues with canola, I typically have two soap boxes. But at this point in the canola game we are behind in terms of getting soil samples collected or applying lime and getting a boost at emergence. So assuming pH is good and you know what your soil nutrient level is we can move on to planting. One thing that over the past seven or eight years keeps coming up is the importance of starter fertilizers and the rates and sources used. Getting that little canola plant off to a good start is extremely important however with that little bitty seed a little goes a long way. The figure below shows the impact of DAP (18-46-0) placed in row, on relative canola stands, when canola was planted in 15” rows. At 5 lbs/A of N or 28 lbs/A of DAP, the canola stand is reduced to 75%. While this seems like a great loss, the compensating nature of canola and the fairly high seeding rates used, this is a manageable level. The benefits of the additional nitrogen and phosphorus applied with the seed also help out-weigh the loss of stand. The addition of the P near the germinating seed is vital. The phosphorus aids in early root and shoot growth, helping the crop to get off to a good start. In areas where soil pH is of concern the P near the young seedling will reduce aluminum toxicity and allow the plant to tolerate the low pH. Keep in mind, while banding P will help in acidic soils, canola is still very sensitive and will not tolerate the same low pH conditions as our winter wheat’s. Impact of DAP (18-46-0) placed in-row on canola stand in terms of lbs N ac-1. One very important factor to keep in mind is the impact of the critical rate and row spacing. The 5 lbs of N per acre critical level set for 15” row spacing is increased to 10 lbs on 7.5’s and cut to 2.5 lbs on 30’s. The change in rate is because we use lbs per acre. 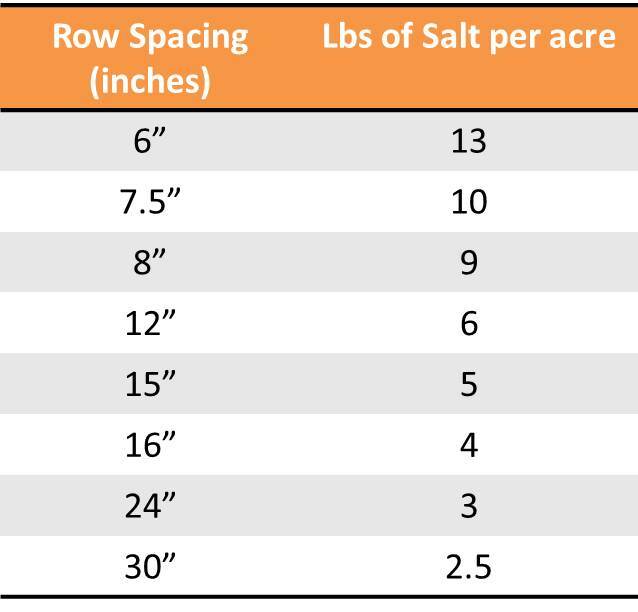 So if you apply the same amount of material per acre on a 15” spacing and a 30” spacing there is actually twice as much material in the 30” row. Table 1, shows the equivalent amount of N placed in row for popular row spacing’s. Equivalent amount of N based on 15″ row spacing. Oklahoma State has released a smart phone app, available for both apple and android devices, to aid in determining maximum in-furrow rates. 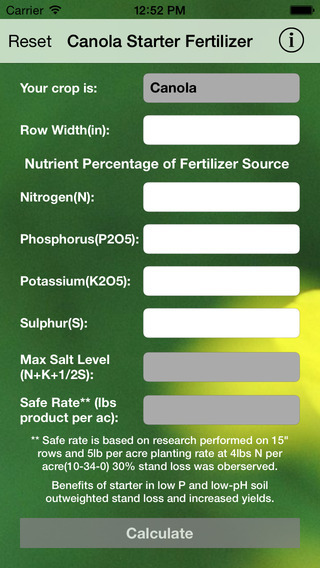 Canola Starter app provides guidelines based upon the nutrient concentrations of the fertilizers you plan to use. The final note on in-furrow fertilizer with Canola, avoid using urea. The likelihood of injury from the urea converting to ammonia greatly outweighs any potential benefits. For further information, comments, or questions please contact Dr. Brian Arnall Extension Precision Nutrient Specialist 405-744-1722 or following me on Twitter @OSU_NPK. Canola Starter available on iOS and Android. For more information see http://www.dasnr.okstate.edu/apps. Soil nutrients are a critical aspect. Soil samples should be collected on a regular basis to ensure optimum productivity. Also, ensure recommendations for winter canola are followed, as nutrient recommendations for other crops may be invalid. For more information canola fertilizer management refer to the nutrient management section by Dr. Arnall. Winter canola grows similar to winter wheat. Fields that can adequately produce wheat have the potential to produce canola. These include, well-drained soils with adequate soil nutrients. However, canola can be more sensitive than wheat. One aspect that canola can be more sensitive to is soil pH. While wheat can be grown in soils as low as 5.5 without significant yield loss, canola must be grown on soils with pHs above 5.8. In fact, canola is best grown in soils with soil pHs ranging from 6.0 to 7.0. Therefore, it is essential that if fields have lower pH, lime be applied with adequate time to neutralize the acidic soil pH before rotating into canola. In addition to all the soil conditions, crop rotation should be considered prior to planting canola. One of the major hindrances in growing canola in rotation with other crops is herbicide carry-over. For detailed information regarding this aspect, refer to table 1 in the weed management section. To account for this, detailed field records should be kept and consulted before rotating with canola. Planting time depends on many aspects. Insured growers should plant within the constrained planting dates. For Oklahoma, the earliest planting date is September 10th with the latest date being October 10th. However, within these guidelines, seedbed and environmental conditions should be the driving factor to determine when to plant. The goal of these planting dates is to have the crop germinate, emerge, and establish 6-8 true leaves prior to the first killing freeze. 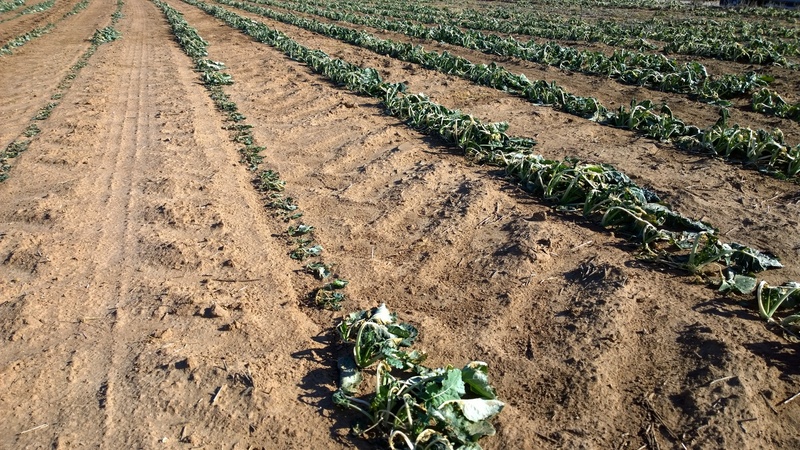 As a general rule, the crop should be planted 4 to 6 weeks before this freeze. To achieve good establishment of the crop, canola should be planted into firm seedbed with adequate soil moisture. If canola is planted into dry soil (dusted in), the effective planting date will be delayed until adequate conditions for germination and emergence exist. In no-till systems, it is important to remember that canola emergence and growth will be slightly delayed. Therefore, if adequate conditions exist, no-till fields should be planted before similar conventionally tilled fields. Since canola is a small seeded crop, shallow planting is required. For best germination and emergence, seeds should be planted between 0.5 and 1 inch. If adequate moisture is available deeper, planting depth can be increased. However, deeper planting has the potential to decrease germination, percent emergence, and early fall growth, so deeper planting should only be used when the planting condition advantage is present and only on certain soils. Therefore, caution should be used in planting deeper than 1 inch. Furthermore, even though moisture may be present deeper, seeds should not be planted deeper than 1.5 inches. 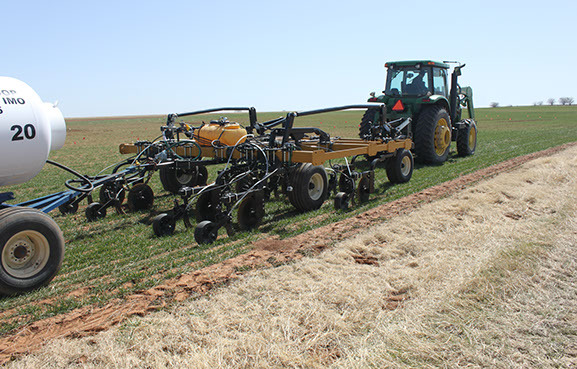 Oklahoma growers have options when deciding row spacing used for planting canola and depend on what equipment there is available and their production system. Since canola is typically rotated within a winter wheat production system, box drills and air seeders are typically widely available. Row-spacing for these can range from 6 to 15 inches. Row spacing within this range has little impact on final yields. As producers move from drills and air seeders to planters, row spacing typically increases from 15 up to 30 inches. All of the row-widths have the potential to produce adequate canola. Some, however, will be more beneficial than others. Narrow row spacing has the potential to result in early canopy closure, reduce potential weed competition, and may help reduce shatter prior to harvest (especially when direct harvested). 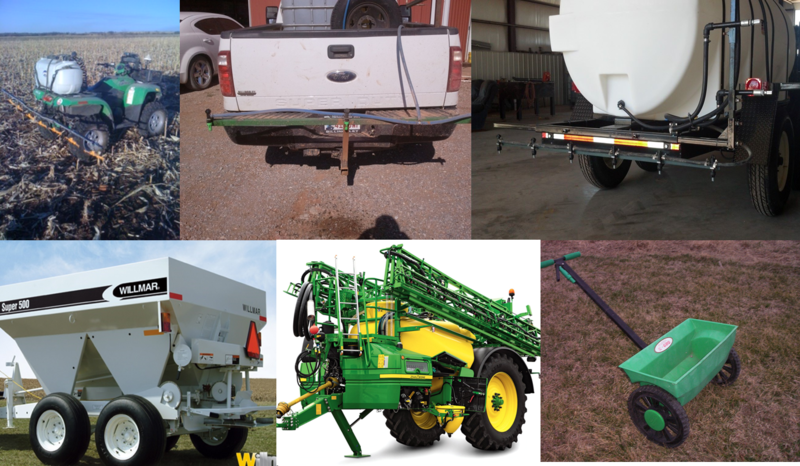 Wider spacing, however, allows for some flexibility in specialized planter attachments used, especially row-cleaners, which can be greatly beneficial in no-till systems. Seeding rates for canola in Oklahoma range from 1 to 5 lbs/A. However, row spacing plays a critical role on seeding rates. When canola is planted on less than 15 inch spacing, some flexibility exists for planting rates. Higher seeding rates can produce more uniform stands, uniform maturity, and thinner stalks that can greatly help harvest efficiency. Too high of stands can increase disease incidence, winterkill, and lodging. When row spacing is increased beyond 15 inches, care should be taken not to over seed. High seed populations can increase fall growth and potentially increase hypocotyl height, which in turn can lead to high winterkill. Optimum populations for this wider row spacing typically range from 2 to 3 lbs/A. For further information, comments, or questions please contact Josh Lofton Extension Cropping Systems Specialist at 405-744-3389 or follow me on Twitter @OSU_oilseeds. While producers have faced many challenges over the last couple of seasons in Oklahoma agriculture, the outlook for winter canola looks very promising for the upcoming season. Producers should focus on taking all of the right steps to ensure the 2015-2016 crop starts on the right foot and takes full advantage of the promising conditions this season. Good luck to everyone one on their upcoming production season and if anyone from Oklahoma State extension can help or assist in any way, please feel free to contact. Every few years I request the results of all soil samples submitted to OSU Soil, Water, & Forage Analytical Labs (www.soiltesting.okstate.edu) under the crop codes of winter wheat and winter canola. Within this data set I can look at trends occurring across the state over time. In this report I will focus on the 2013 results but make some comparison with the 2011 sample values. 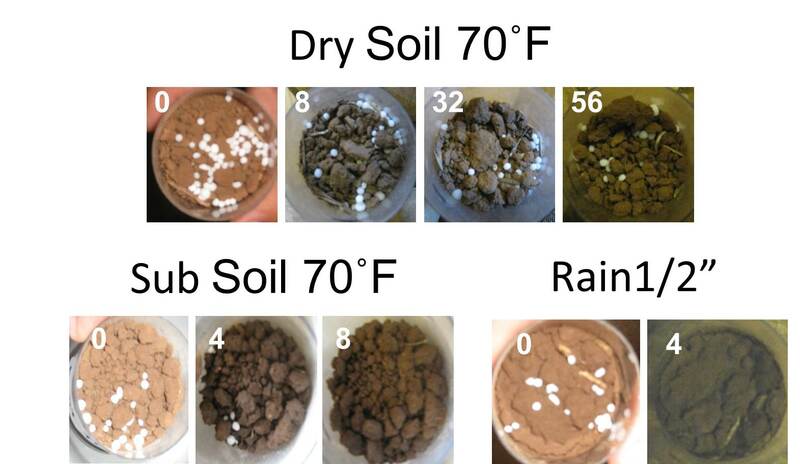 As it pertains to mobile nutrients such as N, S, and B there is little that can be applied from the previous year’s soil samples because their levels in the soil change rapidly. Samples must be collected every year to determine the current status. 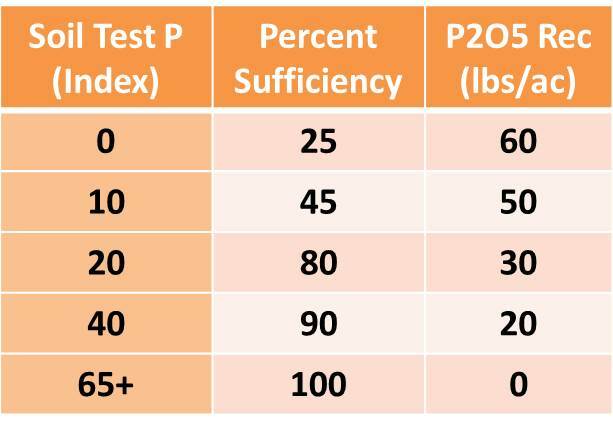 However the soil test levels of immobile nutrients, P, K, Mg, ect are relatively stable over time and the recommendation is to take a close look at these values every three to five years. In 2013 the number of sample submitted increase. There were nearly 1000 more wheat soil samples (2733 to 3574) and 200 more canola soil samples (33 to 231). If the distribution of nutrient levels of the two years are compared the only significant change is that the soil test NO3 level was significantly lower in 2013 (Tables 1 and 2). This is attributed to the extremely dry 2012 spring and summer which delayed the breakdown of wheat straw and immobilization of residual N.
Table 1 and 2. Summary from all samples submitted to SWFAL under the wheat and canola crop codes in 2001 and 2013. Reviewing the 2013 values the most concerning aspect is that 72% of the 3800+ soils samples had a Mehlich 3 P value below optimum soil test phosphorus (STP) of 65 (Figures 1 and 2). That adds up to 109,000 acres needing phosphorus, if you assume each sample represents 40 acres. There is no way to determine how much P2O5 if any was applied to these particular fields. However, an estimated impact of not fertilizing can be calculated. Based on the Oklahoma typical average yield of just below 40 bpa, it would cost the state approximately 575,000 bushels if the land went unfertilized. At $5.00 a bushel that is $2.8 million in revenue. To remedy the low STP it would take approximately 2.76 million lbs P2O5 at a cost of $1.5 million ($0.50 per lb). In the NPKS response study wheat fields across the state were evaluated for a response to additional (in addition to producer’s standard practice) nitrogen, phosphorus, potassium, and sulfur. Phosphorus was the most limiting nutrient at 7 of the 59 harvest locations. A response to P occurred more often than any of the other nutrients tested. It is important to note at all seven fields had been fertilized with P that season, however each time it was below the OSU recommended rate. The response study was a great reminder that it is important to have a good soil test and to follow the recommendations. Figures 1 and 2. 1)Range of soil test P levels (Mehlich 3) for all samples submitted to SWFAL in 2013 under the wheat and canola crop codes. 2) Range of Soil Test P level for all samples with STP<65. Soil pH on the other hand showed a slight improvement from 2011. The percent of samples under 5.5 decreased by 4%, 25 to 21. Of the samples <5.5 the majority fall within the 5.0-5.5 category, which for winter wheat is still within the optimum growth window (Figures 3 and 4). These numbers are a good sign however two points should be made. There is a significant amount of winter wheat acres that is not sampled; much of this is likely to fall below 5.5 soil pH. Figures 3 and 4. 1)Range of soil pH levels for all samples submitted to SWFAL in 2013 under the wheat and canola crop codes. 2) Range of soil pH levels for all samples with pH<5.5. 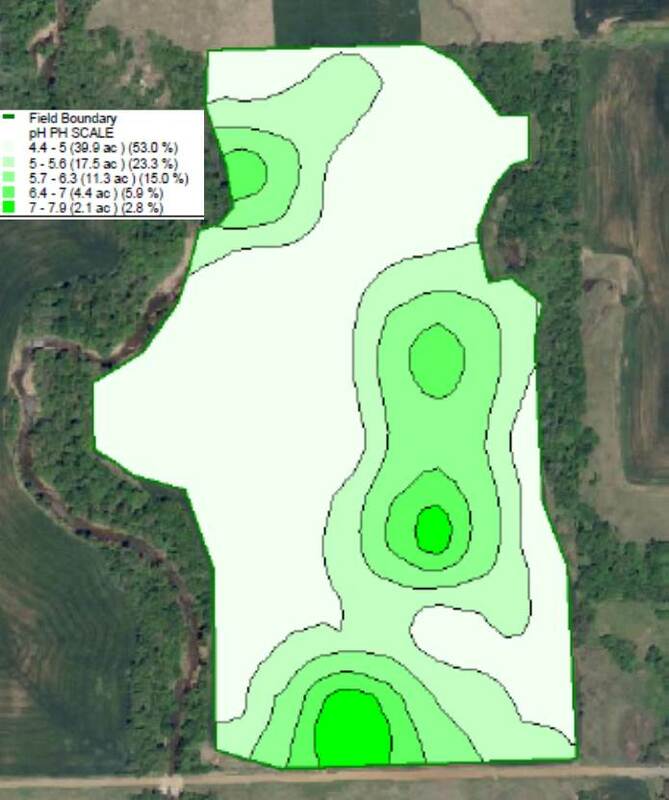 Additionally grid soil sampling and variable rate lime should consider on any field which the composite soil sample pH ranges from the high 4’s to the high 5’s. For example a 75 ac field near Deer Creek had a composite soil sample test pH of 5.3 and buffer index of 6.5. The OSU lime recommendation, for a wheat crop, was 2.2 ton per acre for a total of 166 tons to lime the entire field. However the producer grid soil sampled the field himself at a 2.5 acre resolution (31 samples). Figure 5, shows that the pH of the field ranged from 4.4 to 7.9. Only 33 tons of lime would be required if the field were limed using a variable rate technologies. Cutting the total amount applied by 133 tons would save the producer approximately $4000. Figure 5. Soil pH results from a 75 acre field that was grid soil sampled at a 2.5 ac resolution. Oklahoma wheat and canola producers must take advantage of the weather when it goes their way. Yet if the crop does not have the proper soil pH and nutrients under it, it will never reach its potential. Take the time to collect a soil sample and send it in to a lab. The hour it takes to collect the sample a few dollars you spend on analysis will help ensure that crop you are producing has the best chance of hitting maximum yield in the most economically and environmentally sound manner. Placing Fertilizer with Canola at planting has positives and negatives. With all things holding constant the last canola trials of our project should be picked up by the plot combine Thursday 6-20-13. Before the first yield results comes to my desk I can tell you that we are learning a great deal from the trials this year. 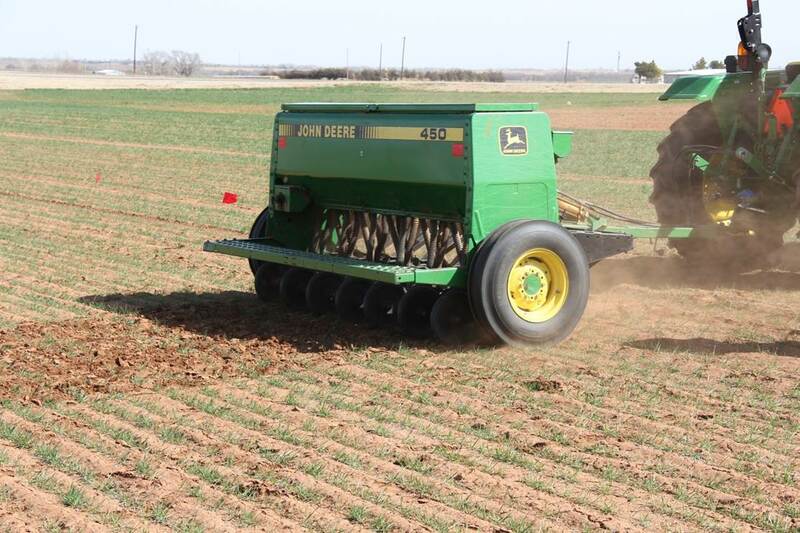 In particular the DAP (18-46-0) placed with seed trail that was supported by the Oklahoma Oilseed Commission. This past year at the no-till site in Perkins, which has a low soil pH, the check plots that did not receive any fertilizer, preplant or banded, did not survive the winter. Additionally at both of our locations, Lahoma (low soil test P) and Perkins, we have documented that oil content was reduced when phosphorus was left out of the treatment. Additionally out of the four site years, that is two locations over two years, the addition of DAP with the seed in-row reduced stand. The graph below shows just how much stand was reduced on a relative basis. 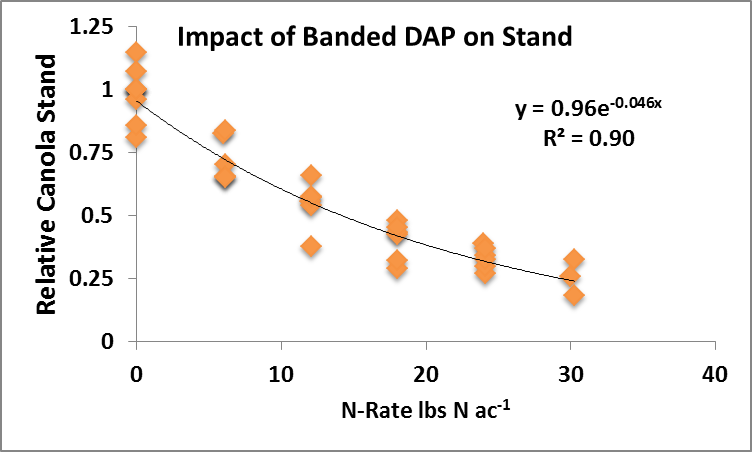 Relative stand is a way to compare the DAP treated to the Check (no DAP) which we assume is 100%. So if we look at the graph below the plots were at 75% relative stand (i.e. 25% loss) at approx 5 lbs N per ac. By about 15 lbs N the stand was down to 50%. There are a few things to keep in mind first, in the case of these trials stand loss did not always mean yield loss. Canola is a great compensatory crop, if there is open space it will grow into it. I will have to run the final yield data to get more answers. These trials were planted on 15″ rows putting down 5 lbs seed per ac, or at least that was the target rate. Many have shown that the seeding rate does not have to be that high if sown properly. I believe in a few cases we may have actually benefited from thinning the stand. However if you were planting 2.5 lbs seed per acre a small loss of stand may be a bigger yield loss. This is one of the question we will have to answer in the future.